Home › What is Filter? Filter is used to analyze data by sorting, arranging in ascending or descending order. Filter numbers allows us to sort the column data smallest to largest or largest to smallest. 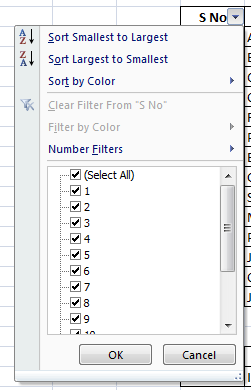 Number filters option allows to sort data with much more criteria also. When we are having text values in column it allows us to sort data in A to Z or Z to A order. Text Filter allows to sort data with many criteria. In case of date values it allows us to sort data in Oldest to Newest or Newest to Oldest order. Date Filter allows to sort data with many criteria. All dates in the Period option allows to sort data which are within any of the months in year or any of the quarters of the year. Click here to see posts related to Filter.